Fixed a bug where using the VANILLA dimension group in the config did not work with white/blacklist modes correctly. ============================================================ Lycanites Mobs Update: Empyreal Rending - Version 1.16.1.0 for Minecraft 1.11.2 Configs older than 1.14.2.2 will be reset. ============================================================ -------------------- New Features: -------------------- Rocs, Raiko, Pinkys and Beholders can now all be tamed as mounts! The Roc and Raiko can both be used to pickup entities and drop them with the mount ability button (X by default). The Roc can also safely pickup Creepers and will ignite them when dropping them. The Raiko has fast swimming speeds as it naturally dives for fish! Pinkys and Beholders can fire their attacks with the mount ability button. Added Roc, Raiko and Beholder Treats. Cacodemons already have a treat item as they were previously tamed pets. 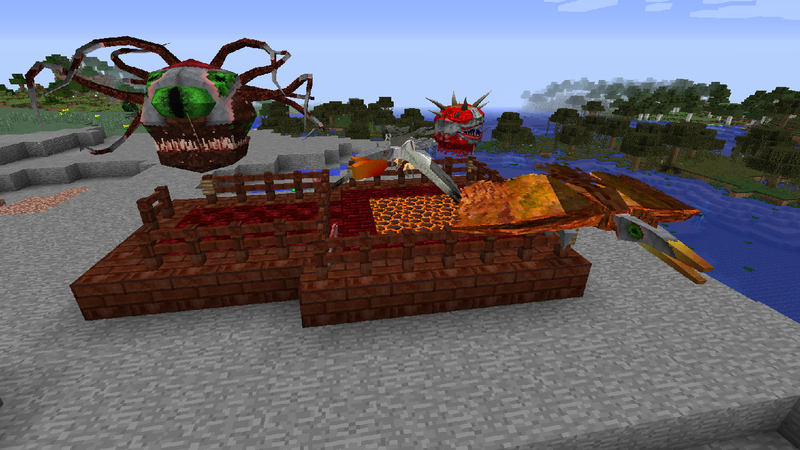 -------------------- Minor Fixes: -------------------- Fixed swimming movement of water/lava mounts. Fixed a bug where using the VANILLA dimension group in the config did not work with white/blacklist modes correctly.